Local tribal organisations said as many as 75,000 tribals adversely affected by the Statue of Unity project would oppose the Prime Minister and the unveiling of statue at Kevadia in Narmada district. The 'Statue of Unity' is set to be unveiled by Prime Minister Narendra Modi on October 31. 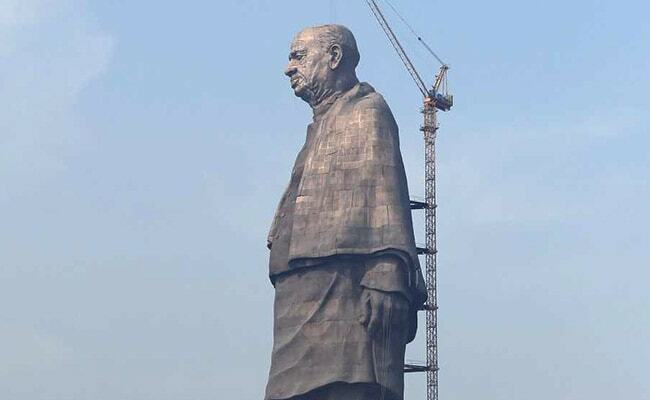 As the BJP government in Gujarat and the Centre gear up for the unveiling of the tallest statue in the world -- "Statue of Unity" of Sardar Vallabhbhai Patel -- by Prime Minister Narendra Modi on October 31, thousands of tribals in villages near the site are bracing for a major showdown against the project. Local tribal organisations said as many as 75,000 tribals adversely affected by the Statue of Unity project would oppose the unveiling in Narmada district. "No food will be cooked in 72 villages affected by the entire project, as we will be mourning on that day. The project is being carried out for our destruction," said Dr Praful Vasava, a tribal leader. Traditionally, food is not cooked in a tribal village when they are mourning for the dead. He told IANS, "Our rights as tribals are being violated by the government. We don't have anything against the great son of Gujarat, Sardar Patel, and his honour should be maintained. We are not against this development even, but this government's development idea is lopsided and against the tribals." The tribals are complaining that their lands were taken away for the Sardar Sarovar Narmada Project, near the statue site, as well as for the statue of unity and all other tourism activities which have been planned in the area. According to Mr Vasava, this "non-cooperation movement" is being supported by around 100 small and big tribal organisations across the state. He said, "Right from Banaskantha in North Gujarat to the Dangs district in South Gujarat, nine tribal districts will be joining us in the agitation. The bandh will not only be limited to schools, offices or commercial establishments, but households will also be silent (no cooking)." Out of the 72 villages affected by the statue project, the most affected are 32, where 19 villages are where rehabilitation has not been allegedly completed, six villages where the current Kevadia colony is situated and seven villages in Garudeshwar block, where only compensation has been paid but other commitments like land and jobs have not been fulfilled. "The government took away our land and only paid us the money for it, but other commitments like alternative land, providing jobs to the affected have not been carried out as per the rehabilitation package, according to the Narmada Tribunal Authority. Some of the affected have not even accepted that money, opposing the land acquisition," said Rameshbhai from Garudeshwar. Of the people who had been allotted land, there are many who are not satisfied. "Gujarat government gave me one hectare land in Sagbara region in lieu of my fertile cultivable land which was submerged in the Sardar Sarovar. But the entire land is uncultivable and totally unproductive. What am I to do with such piece of land?" asked Parchi Bondu, an affected tribal.